Mach3 converts a simple Windows based PC or Laptop to a fully featured CNC controller. Since its inception in 2001, the Mach series of CNC software from Artsoft has evolved into the best available PC-based CNC software on the market. 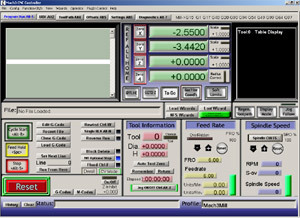 CNCRouterParts is an authorized reseller of Mach3 CNC controller software. Upon purchase, you will be provided with a personal license file via email. All of our current Plug and Play Electronics Systems include a fully-integrated Ethernet Smoothstepper external motion controller, offering many advantages over a direct parallel port connection from your CNC electronics to your PC, including the ability to use any computer running modern 64-bit versions of Windows. If you are running any of our electronics kits or systems with the Ethernet SmoothStepper, please refer to the CNC Software Setup Guide for Mach3 installation and configuration instructions. We also provide XML configuration files as an easy way to set up Mach3 to work with our CNC machines and electronics packages. Intel or AMD processor, avoid Atom-based netbooks, which tend to be a bit too under-powered. Please note that all software purchases are not refundable after your license key is generated. Please ensure this software is applicable to your specific needs before purchasing. This product was added to our catalog on July 15, 2012.